Are you looking to keep your gear safe, secure & dry? 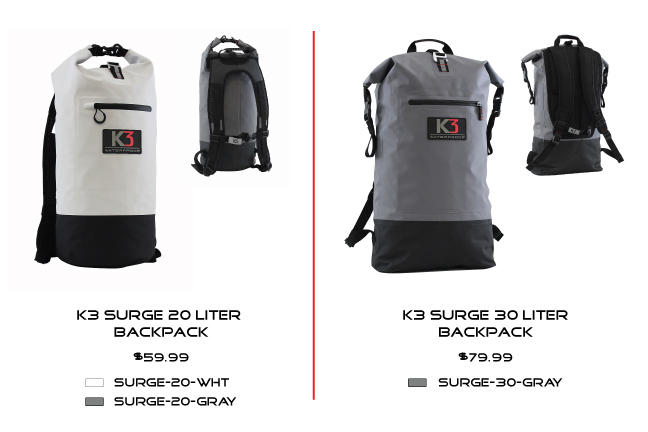 Welcome Surge 20 waterproof dry bag backpack ~ the latest in our leading edge & trend setting waterproof portfolio. Built with ultra-rugged construction and RF heat welded water tight seams, you & your gear will shed water in style. The perfect companion for travel, adventure and sport. Simply stated.......premium product, supreme functionality & un-mistakable style...... Adventure on. Technical Waterproof Dry Bag Backpack uses heat welded seams and no zips, thus in-penetrable by water. Purchased whilst holiday in Chamonix. Quite haute style and quality. I love it.